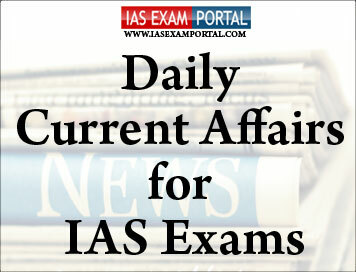 Current Affairs for IAS Exams - 24 JANUARY 2019 | IAS EXAM PORTAL - India's Largest Community for UPSC Exam Aspirants. Chief Justice of India RanjanGogoi on Wednesday informed the crowded courtroom that new norms had been settled by which urgent cases would automatically come up before a Bench for hearing. The CJI takes a call on the spot, whether the case deserves to be heard out-of-turn. This would mean pushing other cases off the list. The CJI has often complained about how cases that were orally represented by a lawyer during mentioning, did not turn out to be as urgent. Justice Gogoi has repeatedly advised the Bar to be circumspect about orally mentioning cases, and to be careful that only absolutely urgent cases are brought before him. He reminded lawyers that the court cannot be seen to be wasting time when hundreds of death penalty cases are waiting for years to be heard. The usual sight of lawyers crowding the courtroom of the Chief Justice of India in the mornings to orally mention their cases for urgent listing may soon become passe. The amendment would impact a population of about 1 croretribals living in Assam, Meghalaya, Tripura and Mizoram, according to the Centre. Inter-State trade can take place in all 124 commodities promoted on e-NAM platform which covers all major cereals, coarse cereals, pulses, oilseeds, spices, flowers, minor forest produce etc. Now more States are planning to start inter-State trade on e-NAM platform. The Union Cabinet chaired by Prime Minister ShriNarendraModi has approved the signing Memorandum of Understanding between India and Kuwait for cooperation on the Recruitment of Domestic Workers. The MOU is initially valid for a period of five years and incorporates provision for automatic renewal. Under this MOU, a Joint Committee will be set up to follow up the implementation of this MOU.The MOU will promote bilateral cooperation in domestic workers related matters between the two countries. The joint training exercise is being conducted with more than a dozen African countries & India. It aims at synergysing humanitarian mine action and joint peace operations. The initial planning conference for the exercise was held in December 2018. The Indian Space Research Organisation (ISRO) will launch a students' satellite Kalamsat and an imaging satellite Microsat-R from the SatishDhawan Space Centre in Sriharikota today. The national space agency's workhorse rocket, PSLV C44, carrying the satellites, is scheduled for liftoff at 11:27 pm. The countdown for the launch began at 7:37 last evening and is progressing smoothly. Kalamsat is a payload developed by students and Chennai based Space Kidz India for the first time. Talking to AIR News, Mission Director of Kalamsat, Dr SrimathyKesan said: ISRO Chairman Dr K Sivan said, the Microsat-R satellite is meant for the Defence Research and Development Organisation (DRDO) purposes. The International Weightlifting Federation(IWF) has revoked the provisional suspension on weightlifter KhumukchamSanjitaChanu for a failed dope test. IWF's legal counsel Eva Nyirfa said this in an e-mail sent to the national federation and Sanjita. He also informed that the IWF Hearing Panel will render its decision on the athlete's case in due course. This will be a major reprieve for the two-time Commonwealth Games gold-medallist who has claimed innocence.